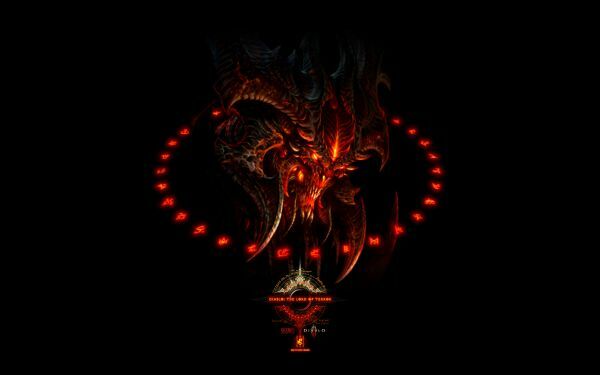 Thirty-three runes and thirty-three wallpapers; Diablo 2‘s runes were 33 strong and that number was important with the 3rd series. It ends as the new year begins. This series was my favorite. Not only due to time I spent on it, but all the changes styles and breakthroughs I’ve done throughout the past 2 years. The 3rd fiery runes series debuted on December 1st 2008, and with it plans for a very different albeit similar wallpaper series. Improving upon the last two with better quality runes and eventually a higher resolution for me to work with. This series has been my pride and joy. I’ve taken so many good and bad hits over the years. I almost gave up when I lost my artwork to two hard drive failures. Not only that I also had so many negative comments here and there that my drive started to wane. As this series ends my plans for the future continue. Will the Fiery Runes Series end? Not likely really; I have more plans that involve it lasting far past the first game and through to its coming expansion(s). My drive now is to have fun with this stuff. If someone doesn’t like my wallpapers then that’s fine if I do this and love doing it then whatever comes afterwards is just awesome. This is my new year’s gift to the Diablo community. The Original artwork of this version of big red is by the amazing Wei Wang and you can see his artwork on the Sons of Storm website. I have been waiting for this piece to be available for years. What a fitting way to end this series! Let’s hope this is the year for Diablo III. See you all soon when the next wallpaper series starts. Also this year look forward to my first ever Diablo 3 fan fiction featuring the characters from The Dark Library news posts in: Chronicles of the Dark Library. Thanks everyone for all the support over the years. Means a lot to me. Gives me the drive to keep going. Thanks for the art work. I know! I did my best though and was please how big red turned out. Glad to share. Wei Wang's art is just beautiful personally.